“Mr. Watson -- come here -- I want to see you.” Soon after that fateful day of March 10, 1876, with the message from Alexander Graham Bell to his assistant Thomas A. Watson, the telephone grew in popularity. In July of 1877, the Bell Telephone Company was formed and by the end of 1877 there were three-thousand telephones in service. The earliest telephone in Hawaiʻi followed the first commercial telegraph, and like the earlier device stemmed from the efforts of Charles H. Dickey on Maui. 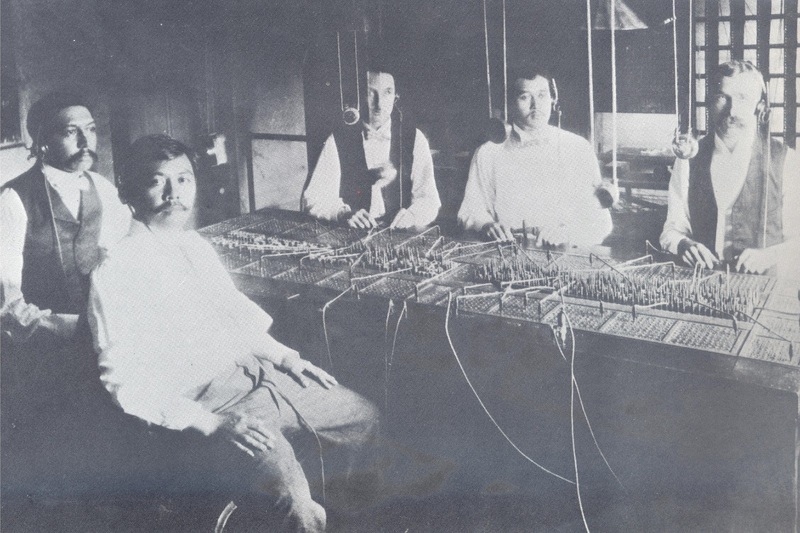 In early-1878, Maui's Charles H. Dickey installed Hawaiʻi's first two telephones between his home and his store. The phones were rented from a Mainland firm and ran on wet cell batteries. On April 11, 1878, Dickey submitted his application for a caveat (a kind of provisional patent), asserting his "intention to introduce into the Hawaiian Islands the Invention known as The Bell Telephone," but the Privy Council apparently failed to act on his request. Less than two weeks later, on April 24, 1878, a letter was sent to the Advertiser from Wailuku stating that "the East Maui Telegraph Company are about to introduce that new wonder of the age, the telephone." In 1878, S. G. Wilder, Minister of the Interior, had a line installed between his government office and his lumber yard, and other private lines quickly followed. Organized service in Honolulu began during the late fall of 1880, and on December 30 the Hawaiian Bell Telephone Company was incorporated. The first calls were operator assisted – the first operators were men. Shortly after the turn of the century, women replaced men as telephone operators. On August 28, 1910, Honolulu telephones were converted to dial operation, but the last manual phones in Hawaiʻi (at Kamuela and Kapoho) were not phased out until 1957. That same year (1957,) the first submarine telephone cable laid between Hawaiʻi and the mainland United States (actually two cables, (one transmitting in each direction.)) This provided the first direct dialing between Hawaiʻi and the mainland. It was replaced in 1989 with more advanced Fiber Optic cable technology. Direct Distance Dialing was made available for calls from Oahu to the Neighbor Islands and Mainland beginning at 12:01 a.m., January 16, 1972. This permitted callers to bypass long-distance operators and reduce charges appreciably. The image shows male telephone operators (Saga of the Sandwich Islands) in the early-1890s. In addition, I have included other images in a folder of like name in the Photos section on my Google+ page. "I Love The Flower That Constantly Attracts"